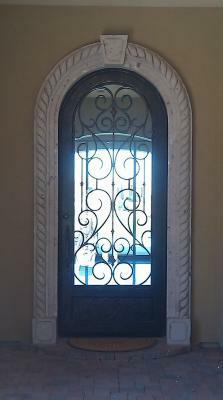 Featured above is a Milan style iron entry door we custom built for a family in Goodyear Arizona. Our standard design has thicker scrolls and tighter curls. At Signature Iron Doors, our main goal is to build the door each customer envisions. They liked the heart style designs, but wanted their scrolls to be more open. They wanted the full arch to compliment their opening, so our technicians configured a drawing that best suited their needs. They came up with this door and this Goodyear family loved it. No matter your iron desires or needs, Signature Iron Doors will meet them. Now a global industry, our work started here in Arizona. Call us and come visit our showroom in Phoenix Arizona to learn about the ideal iron door for your home.